Trying Arabic coffee for the very first time in my life! 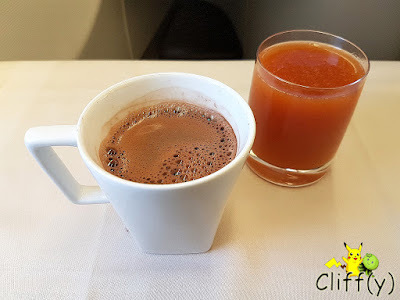 After having a moment of relaxation at the SkyTeam Lounge at Istanbul Ataturk Airport, it was finally time for my BFF and me to leave Turkey. 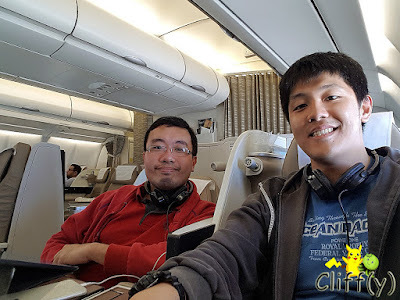 Our virgin experience with Saudia, the flag carrier of the Kingdom of Saudi Arabia, was a memorable one. 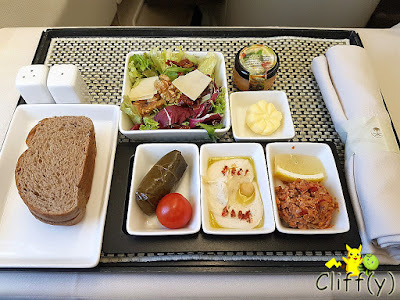 Let's take a look at what were served for Business Class passengers on the short-haul flight from Istanbul to Jeddah. Melon couldn't wait to sample the Middle Eastern dishes in front of her. I chose a refreshing glass of lime juice, while my BFF opted for orange juice that was pretty thick. That was my very first time trying Arabic coffee, something totally different from the coffee I usually drink. 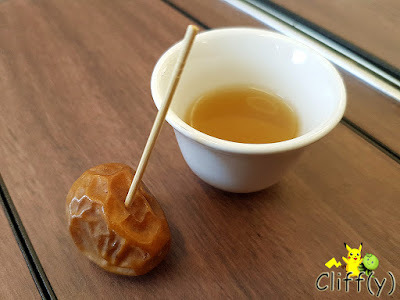 It was very dilute, but fragrant due to the use of spices. 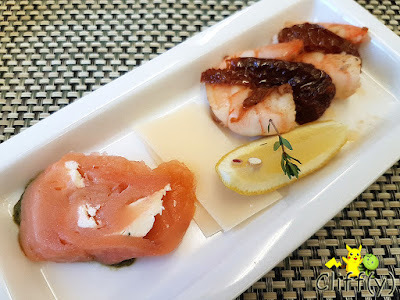 I'm not a fan of dates, but the Sukariya date served onboard was decadent. Topped with walnuts and cheese, the leafy vegetables were fresh. For the dressing, I chose a small bottle of Thousand Island. Presented beautifully were hummus (Levantine mashed chickpeas), stuffed vine leaves and something that I can't really decipher. I recall that the unidentifiable dish wasn't that tasty, but the other two were appetising enough. The salmon rolled with cream cheese could be fresher, but it tasted good. As for the grilled shrimps, they were sweet, but not as succulent as I'd wanted them to be. The sun-dried tomatoes heightened the enjoyment of the dish. It was a pity that there wasn't any garlic bread, so I requested for a piece of whole wheat bread that was pretty fluffy. 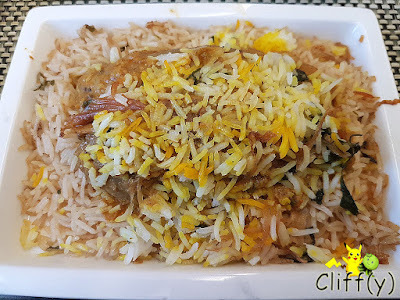 While the Middle Eastern main course might not be that tempting visually, the Basmati rice was delectably light and fluffy. The lamb cooked in an assortment of traditional spices were tender and only mildly spicy. They were pretty generous with the amount of red meat too. 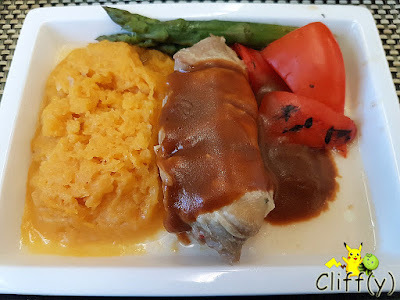 Covered in brown sauce that was oddly thick, the chicken rolled with mozzarella cheese and sage was mildly flavourful, but not as moist as expected. I enjoyed the naturally sweet mashed pumpkins and potatoes more than the meat. The filo pastry was crispy with enough chopped peanuts. 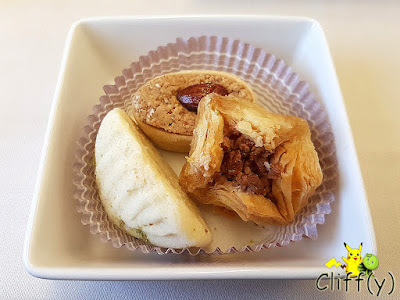 Served alongside it were two others that looked like dried cookies: one stuffed with chopped pistachios and the other had a piece of almond on top of it. I was thankful that all of them weren't overly sweet. 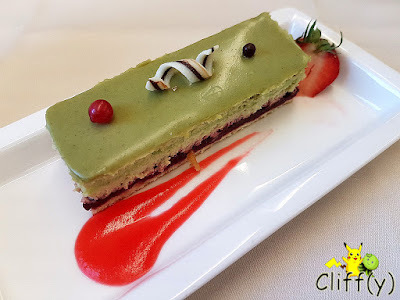 The Western dessert was a light, fluffy piece of cake that juxtaposed the sweetness of the pistachio to the sour of the mousse made of cherries. Presentation wise, I felt that there was just a tad too much strawberry sauce on the plate. 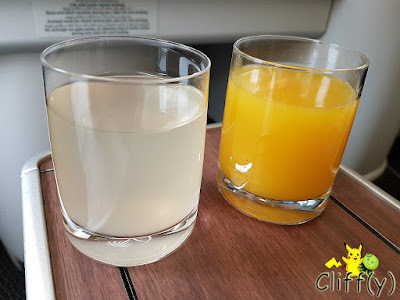 From the small selection of beverages served, I decided to try the mixed fruit juice that turned out to be really satisfying and adequately sweet. I also had a cup of hot chocolate after I finished my dessert. 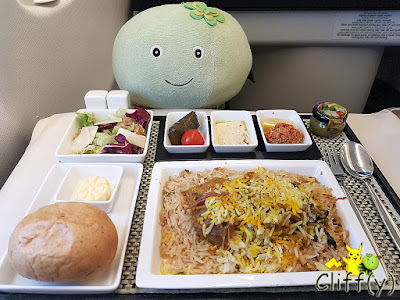 Pika's advice: Do note that due to the strict compliance to the Islamic Law, not only alcoholic drinks aren't served onboard, but you're also not allowed to bring your own. We were so excited to be landing on the Kingdom for the first time, although only as a transit point.